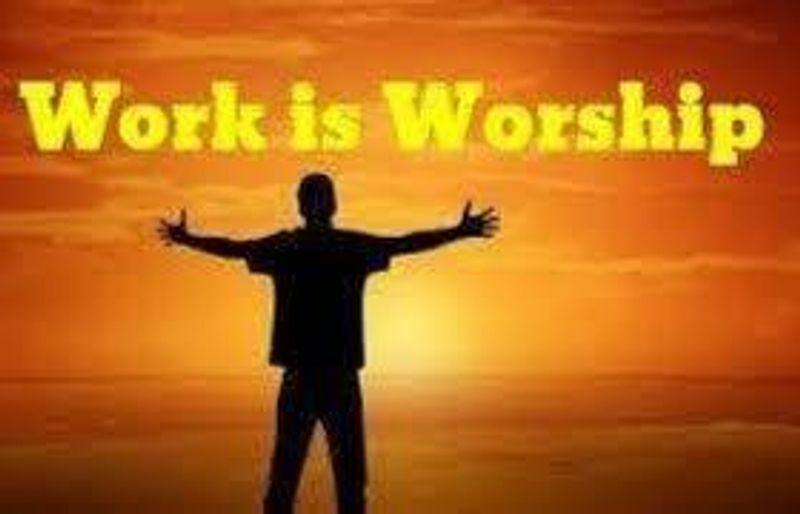 Let’s examine with me why work is worship? Everybody knows this old proverb that 'work is worship' The Bhagwat Geeta says **"karmanye vadhikaraste ma phaleshu kadachana**"
This quote is from Shri Mad Bhagwat Geeta. Its forty seventh verse in second chapter of Bhagawad Gita. This verse explains the importance of disinterested work in the life. As per this verse, individual should work towards his goals, but he must not desire the outcome for the work. Whatever we do singing, writing, teaching, leading or any other type of work; we are most prone to expect the compensation or outcome of the efforts we take. Here we deflect from the principle of disinterestedness. Producing the outcome and results is in the hands of God. Whatever you are doing, you are working for the god. So, your work will be considered as an act of goodwill. He will offer you the eternal peace for your work. In this unique creation of God, we find that all creatures are busy to do some work according to their ability. One cannot live even a single moment without Karma, so Karma is the manifestation of the supreme. This Karma should be for the good of others not for self indulgences. The Ramayana the Gita and the Bible say that live and work for the good of the world, for the good and welfare of all creatures. This universe is created by the God after thinking wisely and everything is put in order. The big and the small the animate and the inanimate objects make together this beautiful Universe of ours. But in this creation, the creation of human being is unique. He is the best representation of God, who can only add something good and beautiful by his own creation to this creation of God. So all our work should be for the good and welfare of the World.